Using 6 cannoli tubes, wrap one slice of bacon around each. Wrap the bacon tightly, overlapping the edges so the bacon fully covers the wrapped portion of the tube. Bake for 20 minutes or until bacon is as crisp as you'd like it. Let cool for 20 minutes or until cool enough to handle easily. Use your hands to gently slide the bacon off the cannoli form while keeping its shape. You may need to wiggle it up and down the tube a bit to get them to come loose, but they should slide off fairly easily. While the bacon is cooling, mix together the ricotta, banana, powdered sugar, and peanut butter until smooth and creamy. Spoon mixture into a piping bag and snip off the end. Pipe the mixture into the bacon tubes. Gently press the mini chocolate chips into the ends of the filling. This sweet and savory twist on the classic Italian pastry is pretty much the best thing ever. Sometimes I feel like a total young’n. For example, when people start talking about Elvis, I’m all nope. Don’t know that song, don’t know his dance moves, and don’t know anything about him except for that weird lip curl thing everyone thought was so cute. But! I am pretty fond of Elvis’s famous flavor combo. Peanut butter, banana, and bacon. And sometimes chocolate. You guys, can you even deal with those flavors? So outrageous! I went ahead and took things to the next level with these bacon cannoli. That’s right. 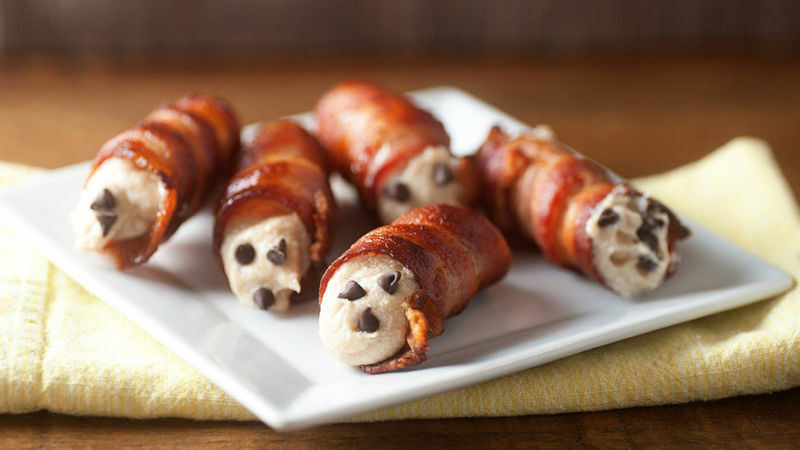 Bacon cannoli. Forget perfecting the perfect cannoli shell. Let’s just use bacon, because bacon makes everything better. Ya heard? Grab 6 cannoli forms and 6 strips of bacon. You’ll use one slice of bacon for each tube. Wrap the bacon tightly around the form, overlapping the edges as you go. You’ll end up with about 3 inches of bacon wrapped goodness when you’re done. Pop those in the oven and let ‘em get crispy and delicious. Meanwhile, let’s whip up our cannoli filling. This is easy peasy. Mix together some ricotta cheese, mashed banana, peanut butter and powdered sugar until it’s all smooth and creamy. If you’re anything like me, you’ll be questioning all of your life decisions at this point. Cheese, peanut butter, and bananas just seem wrong. But hang in there, because it’s actually oh so right. Scoop it into a piping bag and set aside. Now that your bacon is nice and crisp, you’ll want to let it cool for about 20 minutes. Gently slide it off the tubes. All that grease makes it pretty easy to slide off, but if you have trouble just gently wiggle the bacon back and forth and it’ll come free. Now you have a pile of bacon tubes and your life is pretty much complete. Pipe the filling in. I like to pipe it from both ends and meet in the middle. That way the ends are nice and pretty and you don’t accidentally overfill. Elvis would never forgive you if you forgot to stick some mini chocolate chips on the ends of your cannoli, so don’t skip that important step. Delicious bacon cannoli fit for The King!